Happy Not -So- Very- Scary Halloween | I'm Annette! look-alike contest with my daughter in 2011. I have never been a fan of Halloween’s unseemly side, and prefer to focus on celebrating the very American tradition of trick or treating, along with the beauty of the fall season. Even now that my kiddies are no longer of the trick or treating age, I enjoy the young costumed visitors who knock at my door with an enthusiastic “Trick or Treat”. This was my Facebook entry from last November 1, 2012. Just in case you are wondering, the candy corn mentioned was the small, trick or treat sized, pre-packaged variety. In addition to making sure that the treat bowl is filled with goodies to pass out every October 31, I also like to put my home in a festive mood. I have a small table in my entryway that changes monthly with the latest holiday/season. For Halloween I try to keep it simple and non-scary. My hall entryway 2011, as scary as my Halloween décor gets. My family photo pumpkin (bottom middle, and in photo below),my first attempt at decoupaging an artificial pumpkin,with photo printed copies of past family pictures. I used Country Living’s instructions below as my guide. In-between enjoying the trick or treaters on Halloween night, it has become my tradition to watch It’s a Great Pumpkin, Charlie Brown. In fact, there are several “must watch” shows on my schedule to go along with Halloween. I invite you to read through my list below. You may find one, or two, programs that are new to you, and that you may wish to include in your watch list this year. I have been watching this 1966 made for TV special, since its inception. (Yes, I am THAT old!) I never miss it. Elvis in a haunted house, need I say more? with her Halloween night pranks. A Disney made for TV movie that has been a favorite in our family for years. Charles Shaughnessy, of The Nanny fame, stars as the not overly frightening vampire. Gene Wilder stars as Dr. Frederick Frankenstein in this comedy classic. Dean Jones, the “face of Disney films” in the 1960’s, stars in this lesser known Disney tale. All the fun and silliness of Disney films of that era. This is the 1966 color movie based on the TV series. (Fun Fact for ya-Created by the original think tank for earlier TV show “Leave it to Beaver” (1957-1963). Sort of a ”Leave it to Beaver” but played by friendly monsters. Starting with the second season, this family series has had an annual Halloween episode filled with laughs. November 1, 12:30 am EST on ABC Family. Halloween III –October 27, 7:30 am EST, and October 29, 5:30 pm, EST, ABC Family. First, let me say that this movie got a bad rap when it came out. I like it, and I think it is cute. Basically, Will Ferrell’s character is going to play Darren in the remake of the classic “Bewitched” TV series, with Nicole Kidman as his Samantha. Unbeknown to those working on the new show, is that Kidman’s Samantha really IS a witch! of Ghost Breakers starring Dean Martin and Jerry Lewis. Because I love to watch this one anytime, and the Wicked Witch, Glinda, Scarecrow, Tin Man, Cowardly Lion, and Dorothy have become Halloween costume staples. Because this is MY blog, after all. I love the campy Adam West as Batman! Besides, he is dressed in a costume, as are his trusty sidekick and four criminal foils, right? This is the 1966 movie based on the TV series. Margaret O’Brien stars again, this time with Charles Laughton as the ineptly unscary ghost. My family are fans of the British claymation characters Wallace and Gromit. This dog and his master have come up with an animal friendly machine to keep rabbits from eating the community’s vegetables. All in good fun, keep an ear out for all of the little jokes. I am a fan of the Wimpy Kid movies. They make me laugh. This one finds Greg in trouble, as always, including on Halloween. Jackie Chan stars as, you got it, the spy next door! I threw this one in, as it occurs around Halloween. Cute film. Veronica Lake stars as a beautiful witch, who falls in love with the ancestor of the man who persecuted her in the witch trials. A fun comedy. If you do not like anything remotely scary, skip past the suggestions below. To Catch a Thief (1955)-They wear costumes in this, so, of course, it is perfect for Halloween (May I remind you that this is MY list), and besides, Cary Grant is in this. Laurence Olivier, and moves into mysterious Manderley. Grace Kelly are not enough to detour him from snooping on his neighbors. The Birds (1963)-A bunch of birds become hostile in Bodega Bay. James Arness (of Gunsmoke fame) and really giant ants! Steve McQueen stars, with a ball of silicone playing the alien amoeba that terrorizes his Pennsylvania town. A werewolf bites Lon Chaney, and his looks begin to change. Val Lewton, known for his horror films, produced this RKO film, and is the scariest on my list. A nurse moves to the West Indies to care for a sick woman. Jane Eyre was the inspiration for this script. This film can usually be seen on Turner Classic Movies in October. Another Val Lewton produced RKO film. A man unwittingly marries a woman who periodically turns into a very grouchy panther, literally. This film can usually be seen on Turner Classic Movies in October, too. Check out their great article on WDW’s Haunted Mansion. Now that you are armed with a sufficient list of Halloween films, both non-scary and a little scary, why not make tonight one for cookies, and a movie? 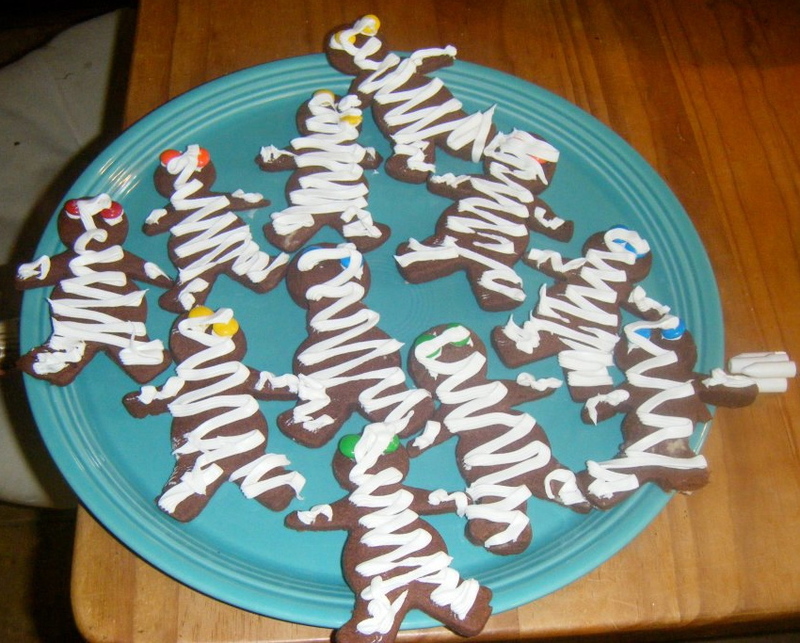 Whip up a batch of these Mummy cookies below, put one on your plate, pour yourself a cold glass of milk, put in a movie, get comfortable, and watch! Wishing you a Happy Not-So-Very-Scary Halloween! I attempt to post my blog weekly on, or around, each Monday. Do NOT make these, as there is currently a problem with the printed recipe. I am looking for the original, so that I may update it. Thank you. In large bowl, beat butter, powdered sugar and vanilla with electric mixer on medium speed about 2 minutes or until creamy. On low speed, beat in flour, and cocoa and 1 to 2 minutes or until well mixed. Divide dough into 2 balls; press each to form disk. Wrap each disk in plastic wrap; freeze 10 minutes. On lightly floured surface, roll 1 dough disk at a time until 1/8 inch thick. Cut with 5-inch gingerbread boy cutter. On ungreased cookie sheets, place cutouts 1 inch apart. Reroll and cut any remaining dough. Bake 9 to 10 minutes or until set. Do not over bake. Cool 1 minute; carefully remove from cookie sheets to cooling racks. Cool completely, 15 to 20 minutes. Use flat tip of frosting can for mummy wrapping. Pipe on frosting, using photo as guide. 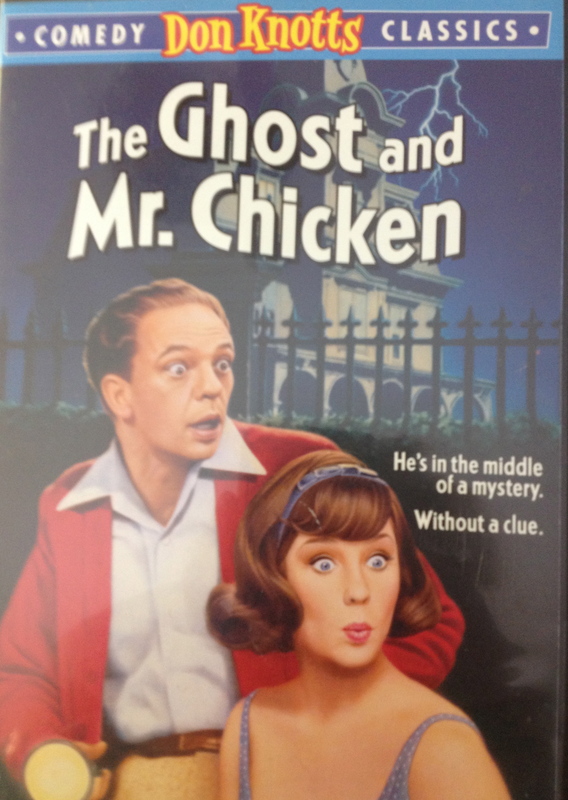 This entry was posted in Uncategorized and tagged Annette's Halloween Movies/TV, Boo Printable, Chocolate Cut Out Cookies, decoupage pumpkin, Family Photo Decoupage Pumpkin, Halloween, Halloween Cookies, Humorous Haunted House Clip, My Mummy's Cookies, not scary Halloween Movies, Not So Very Scary, Not So Very Scary Halloween, Walt Disney World Haunted Mansion. Bookmark the permalink. Loved it Loved it Loved it!!!!! Thanks for sharing..
:o) Thank you, Barb and Red! I appreciate you reading my blog, and your sweet comments. Happy Halloween to you two, too!!! Love the ideas, especially the decoupage pumpkin with the pictures! We have enjoyed Disneyland all decorated for Halloween. The Haunted Mansion is fun. And our favorite meet and greet characters at this time are Jack Skellington and Sally. They were a lot of fun to talk to. And seeing the villains is fun too. reading and your kind comments! Thanks for sending me a note, I love seeing my printable in your home! Thank you also for the link to Ellen. Oh.my.gosh. I am crying with laughter. Soooooo funny!! Thank you for the Boo printable! So cute! I am smiling as I think of you laughing at the Ellen link. It sure made me laugh! Happy Halloween! Great pictures. I loved them. What a fun family you are! Thanks for sharing. Pingback: A Halloween Movie/TV Show Checklist | I'm Annette!